Just a FYI…I will no longer be labeling posts after this post. Mostly because my posts usually brings up overlapping topics and sometimes it’s difficult to figure out which category it falls under. I’m just mentioning this because I know some readers pull up a specific label (e.g. http://kelimalia.blogspot.com/search/label/CI). If you continue to go to a specific label, you will not get any recent updates….just go to the main page http://kelimalia.blogspot.com instead. …has done over 200 songs in BSL (British Sign Language)…. He explains the reason why he learned sign language in his About Me section. Anyways, he did Poker Face by Lady Gaga…then another person decided to add subtitles and the music video. It was pretty cool to hear the song, watch Lee sign it, read the lyrics, and watch the music video all at once. It’s kind of a new concept. I did have to watch it a few times because it is a lot to watch all at once but I really liked the combination….full access to everything! I’m not a big fan of video games or even games in general. Usually the only games I really enjoy are fast paced or physical (e.g. Twister, sports). 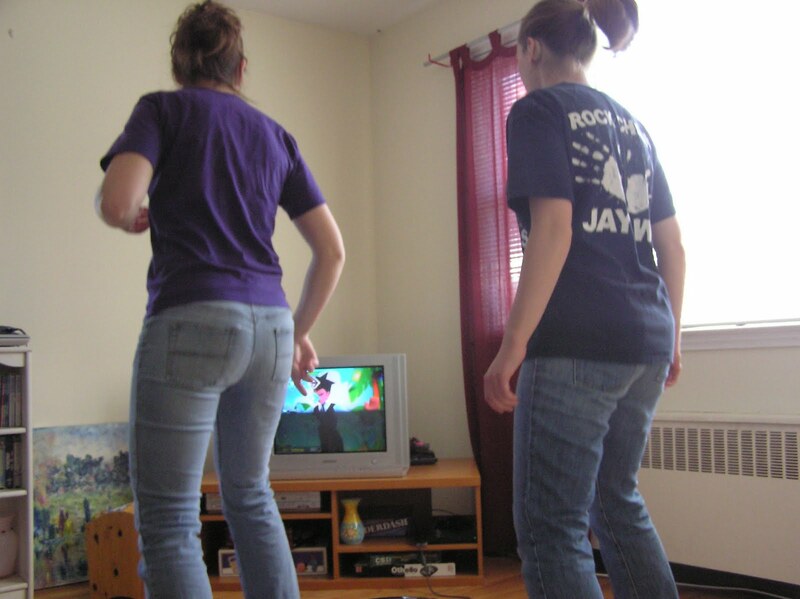 A few years ago I got into Dance Dance Revolution (DDR). I absolutely LOVED the game. I always thought it was good for a deaf person because you didn’t have to hear to play it. I got the game the summer before my 2nd year of graduate school and became a bit…obsessed with it at times. It took me a while to grasp the concept of the game because I couldn’t follow the beat with my HA (even to this day with the CI, I cannot). It got to the point where I would play it for hours at a time or until the downstairs neighbors would take a broom to the ceiling telling me to stop. The odd thing I always found was that it would take me a while to persuade hearing buddies to play it even though they had the advantage of hearing. The only 2 hearing friends who would play it without me begging were my roommates, Sarah and Ashley. Sometimes all of 3 of us would be in the living room jumping around. The word somehow got out to the some of the incoming 1st year class that I liked DDR. I was walking from the library one day during orientation week with a friend and she wanted to introduce me to some of the 1st year students. The first thing a couple of them said to me was….you like DDR?!? Whaa?!? Like they couldn’t imagine a deaf person liking that game (which makes no sense to me because it’s so visual). Then I put the game away for some time because I felt bad for bothering the downstairs neighbors. I then got Guitar Hero which was a great Masters thesis de–stresser. I once again became a bit obsessed with it. I would oftentimes play late at night/early morning so I would mute the TV as not to wake anyone up. That game got put away once I had to put my nose to the grind and complete my thesis. Anyways, Sunday was Super Bowl. After the game, a bunch of us ended up playing Band Hero for almost 3 hours. What was awesome about this…was the fact that out of 11 of us…only 2 were hearing and it took a while to convince just one hearie to even play. The rest of us deafies were all over this game. Yes, a couple of us (not me!) even sang. It’s pretty cool to be able to see the lyrics also. It was just nice to see that no one felt rejected when we were playing Band Hero. Music can be a sensitive issue among some deaf people. However, we had people who aren’t HA/CI users, CI users, and HA users getting into Band Hero. People who usually don’t like music were having a blast and were even singing! One interesting thing is that even though I’m a CI user and was a HA user for a long time…I just could never pick out the beat well enough to follow it auditory. I’ve always followed it visually unlike a lot of the HoH (hard-of-hearing) and CI users in the group. It was nice to see non CI/HA users getting into it also. I don’t have any photos to post of us playing Band Hero (yet…..). To me, you do NOT have to be able to hear to enjoy music. I just enjoy moving around while trying to follow the rhythm (challenging!) on a guitar, dance mat, or drum set. I happened to see this in today’s newspaper. They haven’t posted this weekend’s Ask Marilyn articles online yet so I’m going to type it up here. “Say I have a 50% chance of inheriting a rare terminal illness, and I can be tested to learn whether I have the gene. If the test is positive, and I have the gene, I don’t want to know. yet, if the test is negative, and I do not have the gene, I do want to know. What should I do? –S. Stephens, Hampton Cove, Ala.
After the test, the doctor privately flips a coin marked “positive” and “negative.” If both results–the test and the coin flip–are negative, the doctor tells you the test result. If you wish, you can ask the doctor to flip the coin a second time. Again, if both results are negative, you hear the test result. if either is positive, or both are, you hear nothing. In honor of the upcoming Super Bowl game. Here’s a Super Bowl commercial from 2008 (a classic!). The dancers in this video are deaf. Every so often I forget what’s considered “normal” in the deaf world isn’t always considered “normal” in the hearing world….and vice versa. I drove up to take my grandma to a couple of doctor appointments yesterday. My aunt who lives near her usually helps out, but her son (my cousin) had been admitted to the hospital the other day. Turns out he had to have a defibrillator put in (scary stuff…especially when you’re only 25) and she needed to be at the hospital with him. When I first moved to NYC…I would oftentimes sit by myself, across from hearing friends on subways. This worked great until we hit Grand Central or rush hour….then it was impossible to see them once the subway got full of people. It took a few months for me to realize why they always gave me a funny look when I would go over to the other side of the subway to sit across from them…by myself. There I go blabbing once again. Anyways, I walked into the waiting room with my grandma and automatically sat across from her and near the door to the examining rooms. It wasn’t until she asked me to move over and sit by her that I realized how natural my deaf tendencies are. I tend to scope out a room and figure out where the best place is for me to sit. What I SEE is what I “hear.” If I can’t see it…I can’t “hear” it. Her choice of seat put us with our backs to the door where the nurse calls you in. It was good getting to see my grandma for a bit. My cousin got to go home yesterday which was great news. My friend, Tara, who was in the hospital for preeclampisa gave birth to her son Monday night….even though Dylan’s 5 weeks early, he’s doing great! Tara got to go home today. I’m Trying To Take A Cat Nap…..SHHHH!!! When I first got the CI I was so overwhelmed with all the sounds…including hearing myself breathing. It still catches me off guard at times that I can hear myself breathing. For the most part I don’t hear myself breathing (I naturally tune it out) unless I’ve been working out or something. Anyways, I’ve been hearing my breathing more often in the last few days….probably because I have a cold. I stayed up too late last night (as usual) and paid the price for it today. I decided to start a 227 page library book at 2:30am which I finished about 4-430 am. Double Take: A Memoir by Kevin Connolly. I oftentimes just grab random books at the library without really knowing what they’re about. I had no clue what this book was about until I started reading it. It was an easy and quick reading. For those of you who want to know what it’s about…see the end of this post. I also chose today to try and reduce my daily caffeine intake…which…at this rate, I think I really need my daily dose of caffeine. By dinnertime, I was ready to just crawl into bed and sleep the rest of the evening away. Me: *wakes up again* What…is…that…noise?!? This went on for about 15 minutes before I finally figured it out. Keep in mind I was half asleep while trying to figure it out……hence the reason it took so long. I was hearing myself breathing. I think what was happening was that every time I was about to go into a different sleep stage of the sleep cycle….my breathing pattern changed and I could hear it. I tuned it out whenever I was in the dozing off stage and couldn’t hear it until I was about to actually fall asleep. How did I solve that problem? Took the CI off and got a much needed 10 minutes power nap!